I spent the day starting my journey into the AP Biology world. I drove an hour to get to a conference today, a Saturday, and I can hardly fault the College Board for it being so lovely outside. At lunchtime, I wandered around Red Bank Regional High School--they have a pond there, not much more than an elaborate puddle, and at one end of the pond a tree has fallen. I leaned in the crook of the tree in the warm early spring sun, and watched the tiny fish dance just below the surface of the pond. Inside we discussed a lab that measures the heart rates of Daphnia at different temperatures. Daphnia (water fleas) are little critters that live in ponds like the one just outside our classroom today. Our teacher warned us that Daphnia can die if stressed too much by temperature changes. She does not toss her Daphnia down the drain when she is done--she keeps a jar of pond water in her class. Makes sense to me. Not sure it made sense to everyone in the classroom, though. There's a disconnect between AP Biology and watching fish bounce around in the suddenly warming waters the mudhole just yards away from our classroom, chasing Daphnia. About fifty thousand high school students got 4s or 5s on last year's AP Biology exam. Rutgers, the flagship of our public universities, charges about $300 per credit hour. Biology is worth 4 credit hours. Universities and the College Board will continue to argue the validity of the AP biology course. Money talks. Of the 50,000 or so students that earn 4s or higher on the exam, I wonder how many actually wonder about the Daphnia eating, screwing, breathing in thousands of ponds within a mile or two of all the testing centers in the United States. If you do not wonder about the Daphnia in your neighborhood, if you do not care about the Daphnia in your neighborhood, then you should not be entrusted with 21st century technologies. No way to test that, of course, and even if there was, most people would think only a nut would consider the Daphnia. Still, Daphnia matter. If Daphnia cannot live in the water I drink, I do not want to drink it. 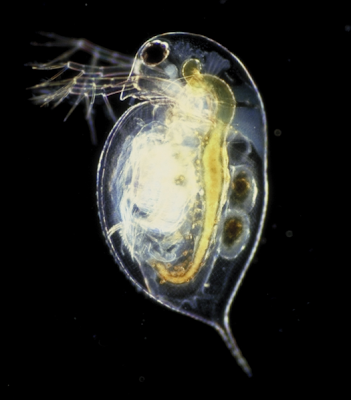 Daphnia are used as "biomoitors"--if the daphnia start acting beserk, something is wrong with the water. If I present my love affair with Daphnia in economic terms--biomonitoring, water quality, human health--folks figure I know something worthwhile. So I can pretend that's why I stared into the water at the pond's edge today. But that would be lying. I like the idea that Daphnia exist, that they do pretty much everything I do (except maybe keep a blog), and that their existence is both absolutely incomprehensible in human terms yet makes perfect sense beyond our artificial sphere. The Daphnia photo is by Paul Hebert at the Public Library of Science, via wikimedia. Daphnia are way cool. I was involved with an after school science program where one group tested the effects on daphnia of the components of sports drinks. I'm envious of your time by the "pond". The disconnects are a big issue. I know they are changing the AP Chem Structure, is there a similar effort for Bio? I kept a wonderful Daphnia culture for a long time. They are way fun. According to the conference yesterday, yes, the AP Biology program is about to have big changes, possibly by 2011. If so, I get to do an audit twice in three years. Wheeee~! I may be getting my own room next year. If so, I'll set up both a Daphnia playground and the "Bill of Rights" your Dad made a couple of years ago.